Met de B-Klasse Electric Drive zet Mercedes Benz een mijlpaal op de weg naar nul-emissie. Een uitgebreide toelichting op de levenscyclus van deze auto, die op de markt verwacht wordt in de loop van 2015, vindt u in de 58 pagina’s tellende Engelse Brochure “Life Cycle – Environmental Certificate Mercedes-Benz B-Class Electric Drive” | pdf. De belangrijkste informatie uit de brochure hebben we hieronder voor u op een rijtje gezet. Leest u liever een samenvatting in het Nederlands, dat kan in het artikel op deze site: Mercedes Benz bluezero B elektrisch rijden. The new B-Class Electric Drive meets many customers’ demands for emission-free motoring without foregoing the hallmark attributes of a Mercedes-Benz: safety and comfort. And, let’s not forget: exhilarating driving pleasure. As proof of its vehicles’ environmental compatibility, Mercedes-Benz is the world’s first automotive manufacturer to have held Environmental Certificates in accordance with the ISO TR 14062 standard since 2005. 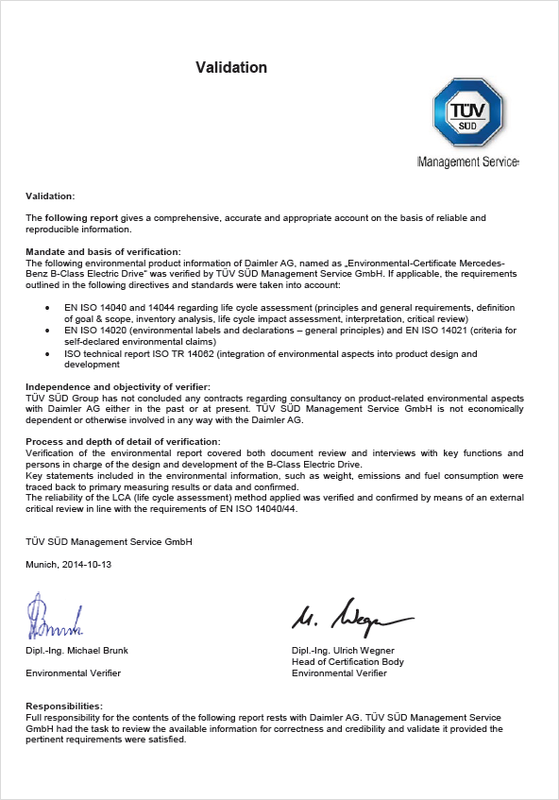 Over and above this, since 2012 the requirements of the new ISO 14006 standard relating to the integration of environmentally compatible product development into the higherlevel environmental and quality management systems have been met, as also confirmed by TÜV SÜD Management Service GmbH. The Environmental Certificate for the B-Class Electric Drive documents the improvements achieved compared with the comparable model with combustion engine. Both the process of environmentally compatible product development and the product information contained herein have been certified by independent experts in accordance with internationally recognised standards. With the B-Class Electric Drive, Mercedes customers benefit from an efficient drive module, local emission-free driving and a comprehensive recycling concept, for example. Furthermore, a high percentage of the materials used are high-quality recycled materials and renewable raw materials. The B-Class Electric Drive thus offers a very good environmental performance. 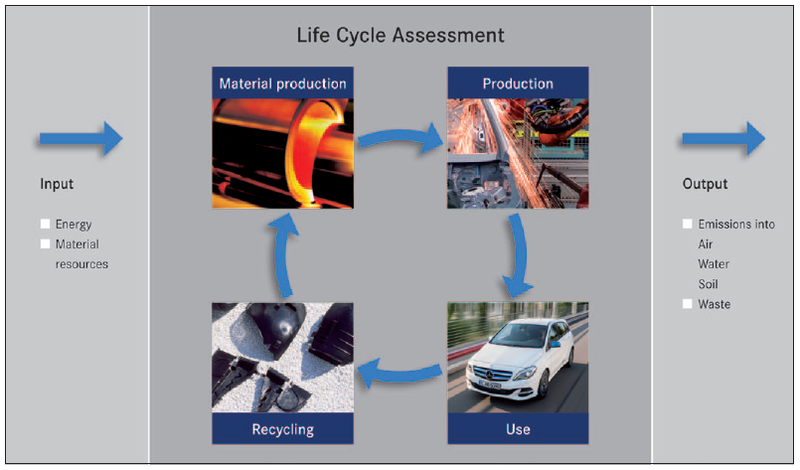 Since the beginning of 2009, “Life Cycle” has been presenting the Environmental Certificates for Mercedes-Benz vehicles. Above all the principal aim of this documentation series is to provide the best possible service to as many interested parties as possible: on the one hand, the wide-ranging and complex subject of the “car and the environment” needs to be communicated to the general public in a manner which is easy to understand. On the other hand, however, specialists also need to have access to detailed information. “Life Cycle” fulfils this requirement with a variable concept. 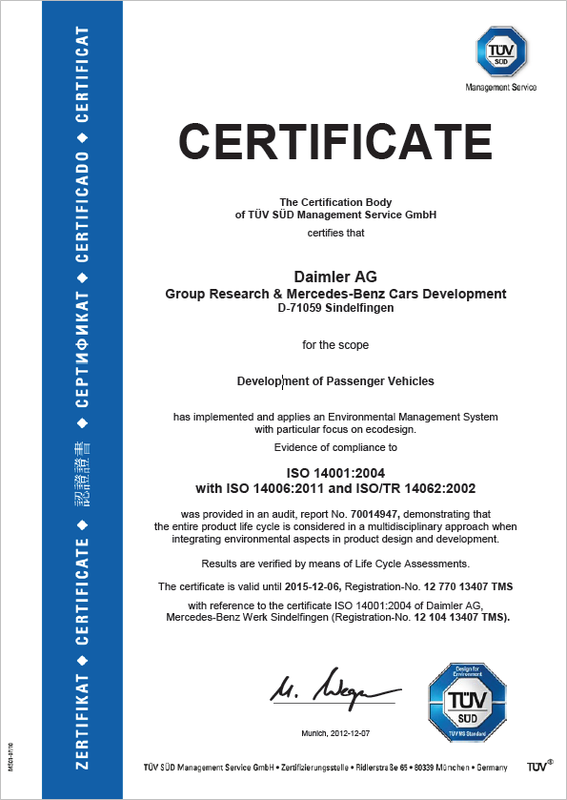 With its service-oriented and attractive “Life Cycle” documentation series, Mercedes-Benz is once again demonstrating its pioneering role in this important area – just as in the past, when in 2005 the S-Class became the very first vehicle to receive the Environmental Certificate from TÜV Süd (South German Technical Inspection Authority). 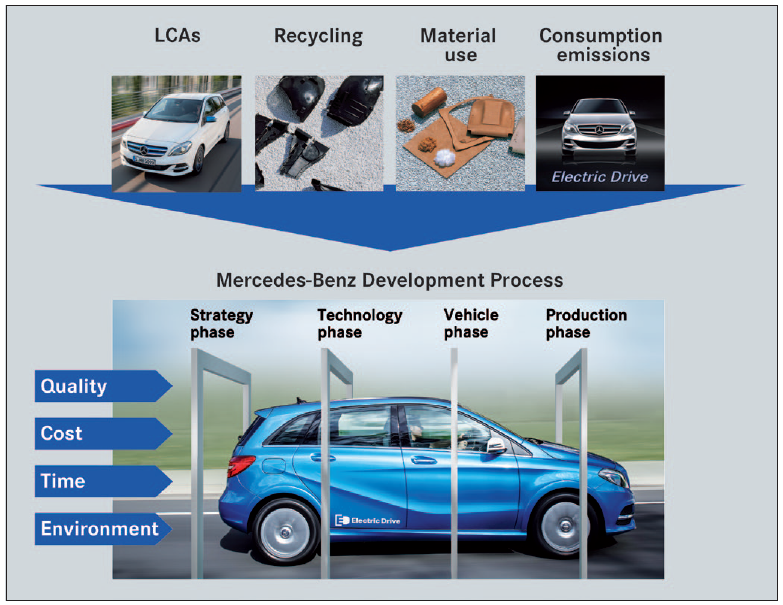 This issue of “Life Cycle” sees Mercedes-Benz breaking new ground once again, documenting all relevant environmental aspects of an electric vehicle in comprehensive form by reference to the example of the B-Class Electric Drive. 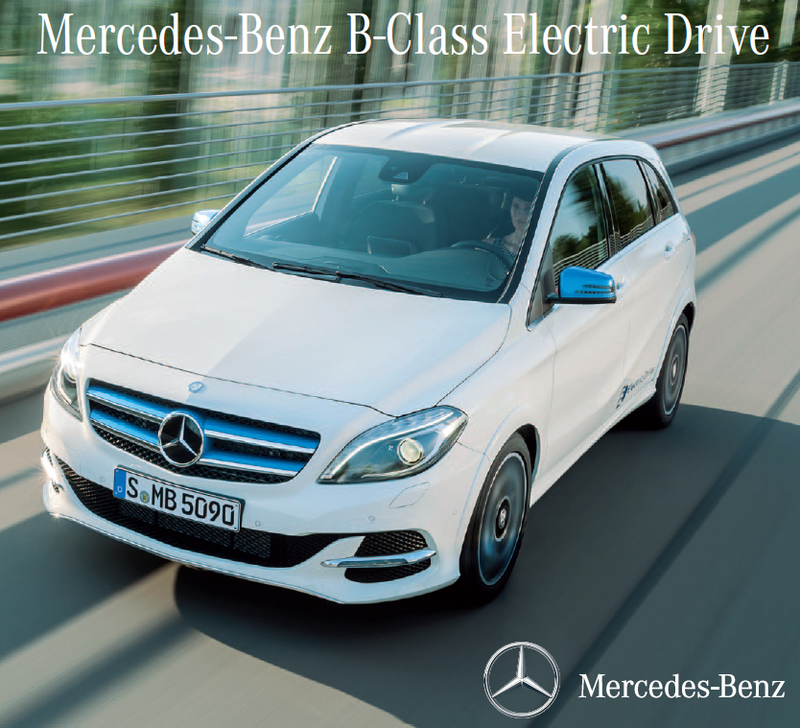 With its torquey electric motor, the B-Class Electric Drive offers lively and effortlessly superior fun at the wheel over a range of around 200 kilometres – all locally emission free. The new B-Class Electric Drive surprises with an especially dynamic driving experience: it provides noticeably powerful acceleration and glides almost silently along country roads. The new electric Mercedes offers the driver and up to four passengers the familiar high standards of ride comfort in a high-class, spacious and precision-designed interior. The B-Class Electric Drive combines dynamism and driving pleasure with zero local emissions. Quiet and local emission-free driving is ensured by a 132 kW electric motor which, as is typical of an electric drive, delivers its maximum torque of 340 Nm straight from idle state. This is approximately equivalent to the torque from a modern three-litre naturally aspirated petrol engine. The result is noticeably powerful acceleration from rest. For the standard sprint from zero to 100 km/h, the electrically powered B-Class requires only 7.9 seconds. Effortlessly superior driveability and exhilarating driving pleasure with a high level of dynamism are thus guaranteed in every situation. 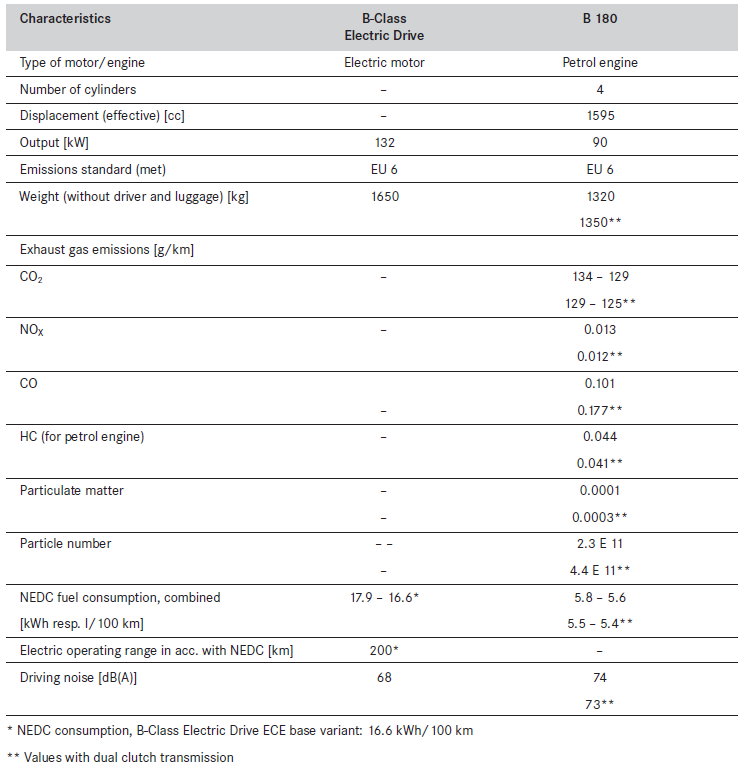 The following table documents key technical data of the new B-Class Electric Drive and the B 180 petrol variant with which it is compared in the Life Cycle Assessment. The weight and material data were determined on the basis of internal documentation of the components used in the vehicle (parts list, drawings). The “kerb weight according to DIN” (without driver and luggage) served as a basis for the recycling rate and Life Cycle Assessment. 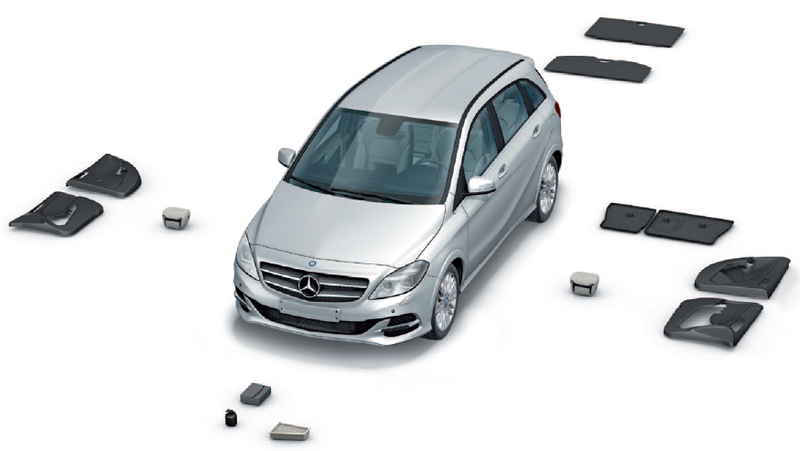 The environmental profile documents general environmental features of the B-Class Electric Drive with regard to such matters as energy consumption and local emission-free driving. It also presents specific analyses of environmental performance, such as the Life Cycle Assessment, the recycling concept and the use of secondary and renewable raw materials. by converting the kinetic energy produced during braking into electric power and feeding it to the battery. The environmental compatibility of a vehicle is determined by the environmental burden caused by emissions and the consumption of resources throughout the vehicle’s lifecycle. The standardised tool for evaluating a vehicle’s environmental compatibility is the Life Cycle Assessment. It comprises the total environmental impact of a vehicle from the cradle to the grave, in other words from raw material extraction through production and use up to recycling. With the adoption of the European ELV Directive (2000/53/EC) on 18 September 2000, the conditions for recovery of end-of-life vehicles were revised. Establishment of systems for collection of end-of-life vehicles (ELVs) and used parts from repairs. Achievement of an overall recovery rate of 95 percent by weight by 01.01.2015 at the latest. Evidence of compliance with the recycling rate as part of type approval for new passenger cars as of December 2008. Take-back of all ELVs free of charge from January 2007. Provision of dismantling information to ELV recyclers within six months of market launch. Prohibition of lead, hexavalent chromium, mercury and cadmium, taking into account the exceptions in Annex II. In addition to the requirements for attainment of recycling rates, manufacturers are obliged by Article 4, Paragraph 1 (c) of the European ELV Directive 2000/53/EC to make increased use of recycled materials in vehicle production and thereby to establish or extend the markets for recycled materials. To comply with these stipulations, the specifications book for the B-Class Electric Drive stipulated a target value for the percentage of secondary raw materials. The main focus of the recyclate research accompanying vehicle development is on thermoplastics. In contrast to steel and ferrous materials, to which secondary materials are already added at the raw material stage, recycled plastics must be subjected to a separate testing and approval process for the relevant component. Accordingly, details of the use of secondary raw materials in passenger cars are only documented for thermoplastic components, as only this aspect can be influenced during development. The quality and functionality requirements placed on a component must be met both with secondary raw materials and with comparable new materials. To ensure passenger car production is maintained even when shortages are encountered on the recycled materials market, new materials may also be used as an alternative. 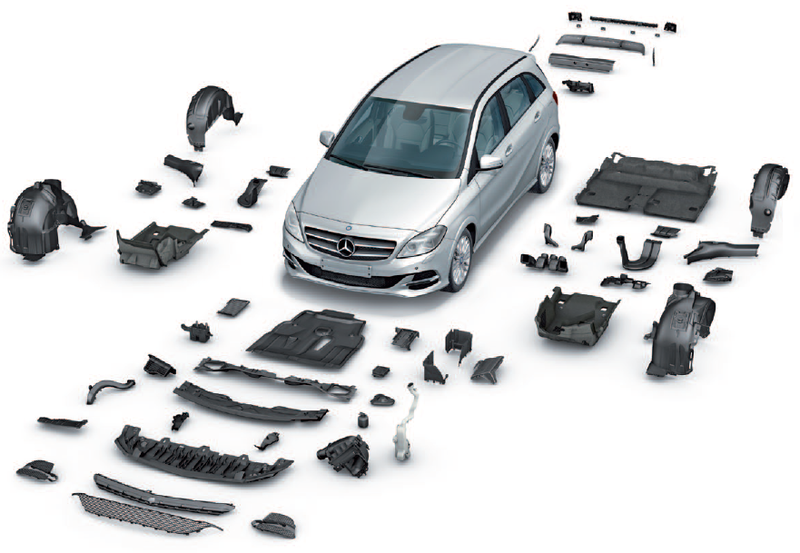 In the B-Class Electric Drive, 58 components in all with an overall weight of 31.9 kilograms can be manufactured party from high-quality recycled plastics.Typical areas of use are wheel arch linings, cable ducts and underbody panels, which consist for the most part of polypropylene. The figure shows the components for which the use of secondary raw materials is approved. 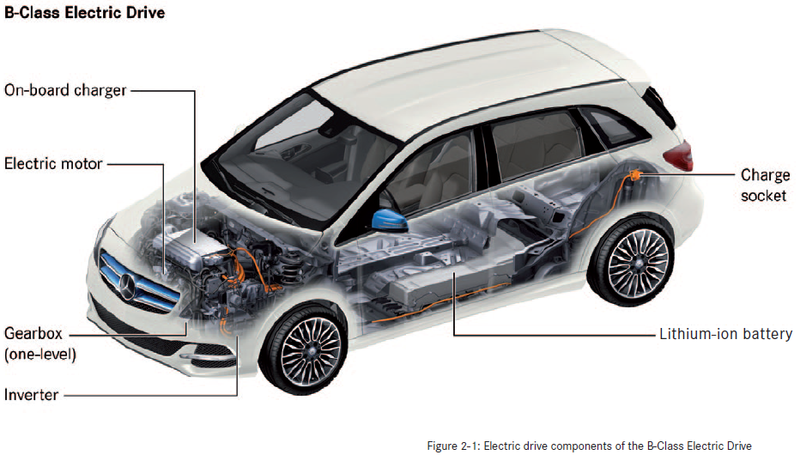 Compared to the combustion-engine variants of the B-Class, the Electric Drive differs with regard to components which are directly related to the drive system, such as the plastic fuel tank. A further objective is to obtain secondary raw materials wherever possible from vehicle-related waste flows, so as to achieve closed cycles. In the case of the wheel arch linings of the B-Class, for example, a secondary raw material comprising reprocessed vehicle components is used: starter battery housings, bumper coverings from the Mercedes-Benz Recycling System (MeRSy), and production waste from cockpit units. Compared with glass fibres, the use of natural fibres usually results in a reduction in component weight. Renewable raw materials help to reduce the consumption of fossil resources such as coal, natural gas and crude oil. They can be processed by means of conventional technologies. The resulting products are generally readily recyclable. If recycled in the form of energy they have an almost neutral CO2 balance, as only as much CO2 is released as the plant absorbed during its growth. In all, 13 components in the new B-Class Electric Drive with a total weight of 15.3 kilograms are made using natural materials. Reducing the environmental impact of a vehicle’s emissions and resource consumption throughout its life cycle is crucial to improving its environmental performance. The environmental burden of a product is already largely determined in the early development phase; subsequent corrections to product design can only be implemented at great expense. The earlier environmentally compatible product development (“Design for Environment”) is integrated into the development process, the greater the benefits in terms of minimised environmental impact and cost. Process and product-integrated environmental protection must be realised in the development phase of a product. The environmental burden can often only be reduced at a later date by means of downstream “end-ofpipe” measures. use of environmentally friendly materials. • Wat Bitcoin en Zonne-energie gemeen hebben? Mercedes-Benz B Electric Drive: Rijrecensie! Welk onderhoud hebben zonnepanelen nodig? Terugverdientijd van zonnepanelen: Een berekening! Wat kosten zonnepanelen? Een berekening! TOP materiaal voor echte TOP prijzen. Terugverdientijd van zonnepanelen? Een berekening stap voor stap. Nuttige tips om thuis energie te besparen.